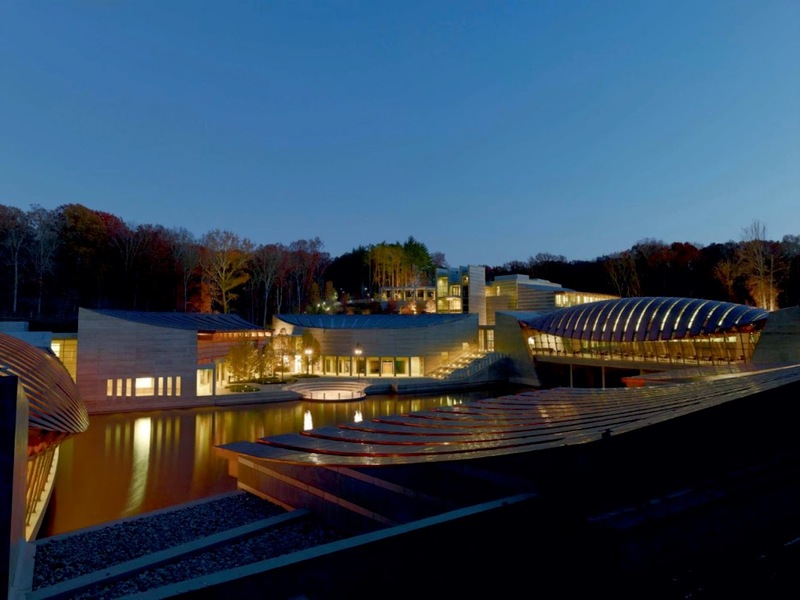 " Crystal Bridges Museum of American Art is nestled within a ravine, flanked by two hills set on one hundred and twenty acres of Ozark landscape. Upstream to the south is Crystal Springs and, beyond that, the family residence designed by the celebrated Arkansas architect Fay Jones. The hillsides, which contain a network of trails that lead to downtown Bentonville, are covered with mature growth of oaks, dogwoods and crowned by Arkansas white pine on the crest. 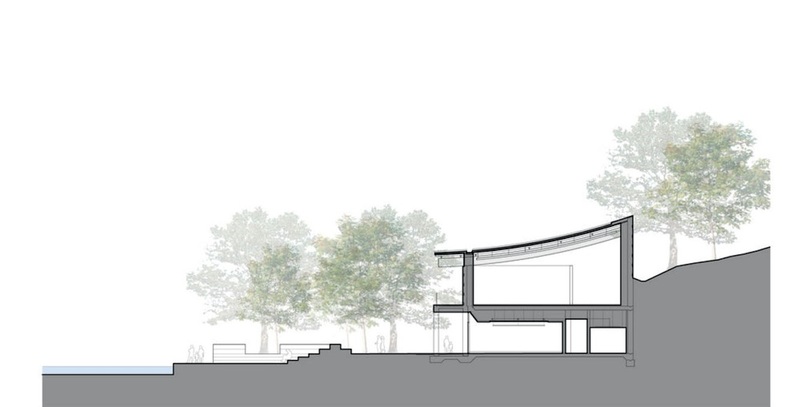 From the outset, we aimed to design a museum in which art and nature are experienced simultaneously and harmoniously. the museum is entered from the crest of the hill, with a dramatic overview of the entire complex. From the parking and drop-off, one descends by stair or elevator to the pond level. The public then circulates from one museum pavilion to the other, circling and crossing the ponds with open vistas all around. the surrounding crown of trees is clearly visible above the roof line of the museum in all directions. Two bridge-like structures are constructed across the ravine, forming large ponds, with a difference of 12 feet in height, retaining the northbound flow of water. 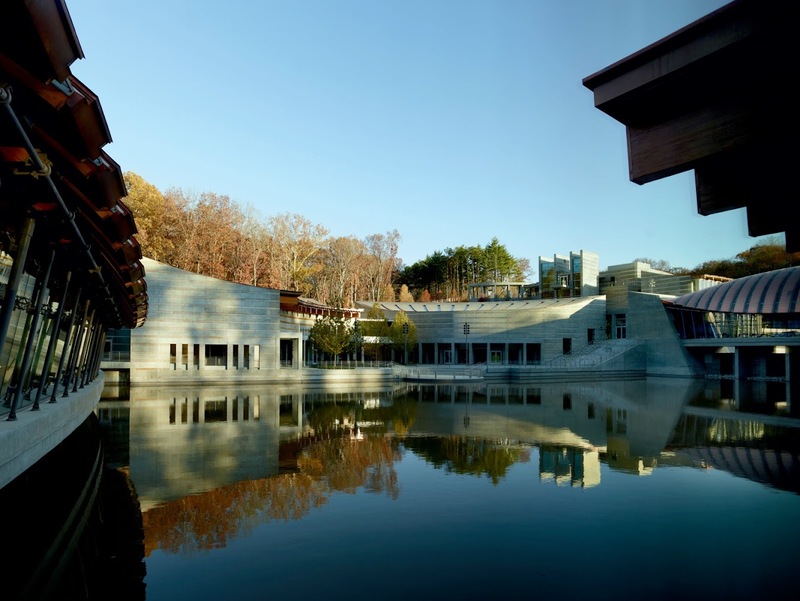 the two ponds form the centerpiece around which the structures that constitute the museum are clustered. In all, the museum is comprised of eight pavilions, three of which abut the ponds and are sited so that they retain the hillside. 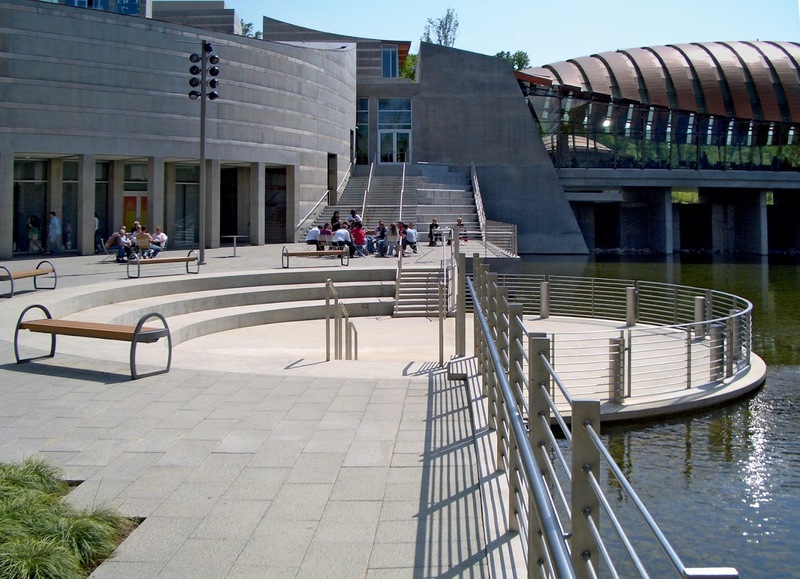 Two pavilions span the pond while acting both as dams and bridges. One pavilion – the great hall, is set as apeninsula, connected to the mainland by a curving series of galleries. the museum program includes diverse galleries,, library, educational spaces, a restaurant, a great hall / auditorium with appropriate museum services and a parking structure. Moving through the museum complex, one flows from inwardly focused spaces, serving as galleries and classrooms to other areas where there are dramatic openingsto and views of the surrounding landscape. Moving through galleries, one is continuously reintroduced to the surrounding landscape through the series of glazed passages. 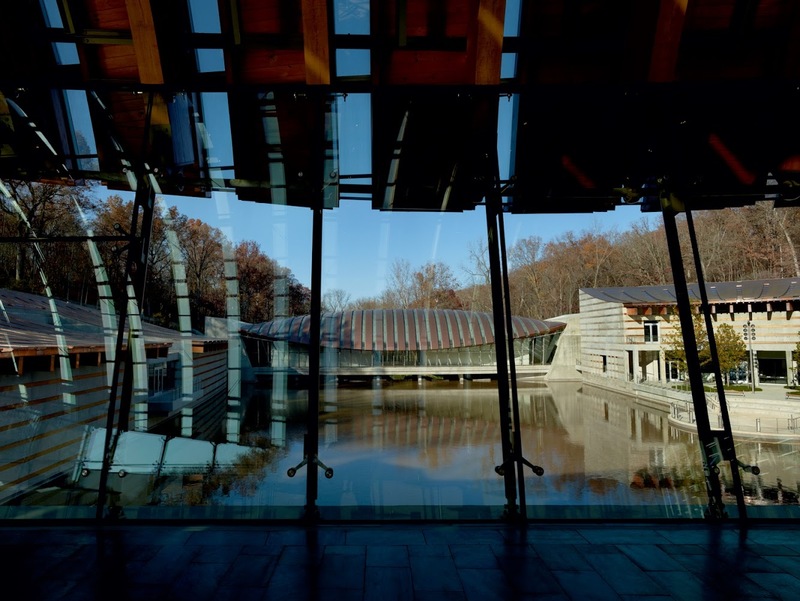 Interspersed between the pavilions, sometimes abutting them or contained by them, are a series of outdoor landscape spaces; an entry courtyard, an amphitheater-like crescent garden overlooking the pond, a meadow extending southbound towards Crystal Springs. 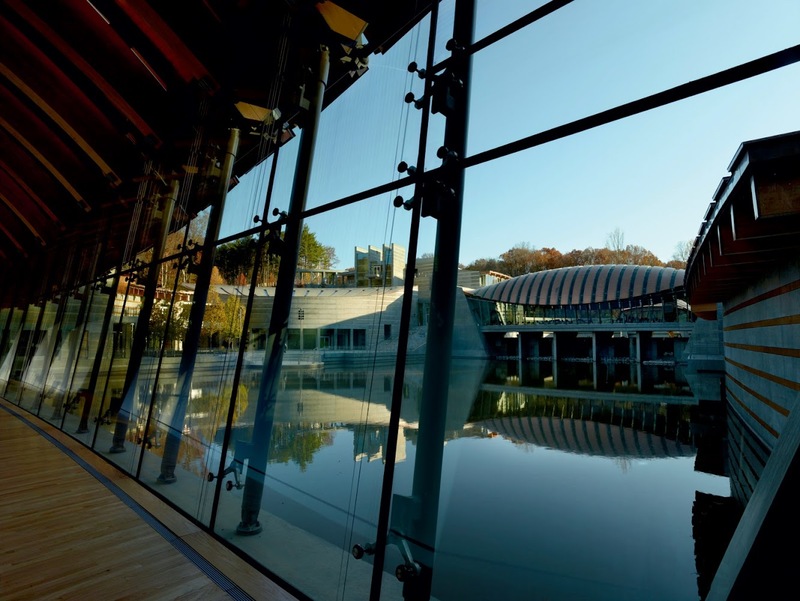 Each of these spaces provides for a diversity of activities –banquets and parties, lectures and seminars, performance space, outdoor dining– and is framed by dramatic views and extends the network of indoor and outdoor spaces into the wider landscape. 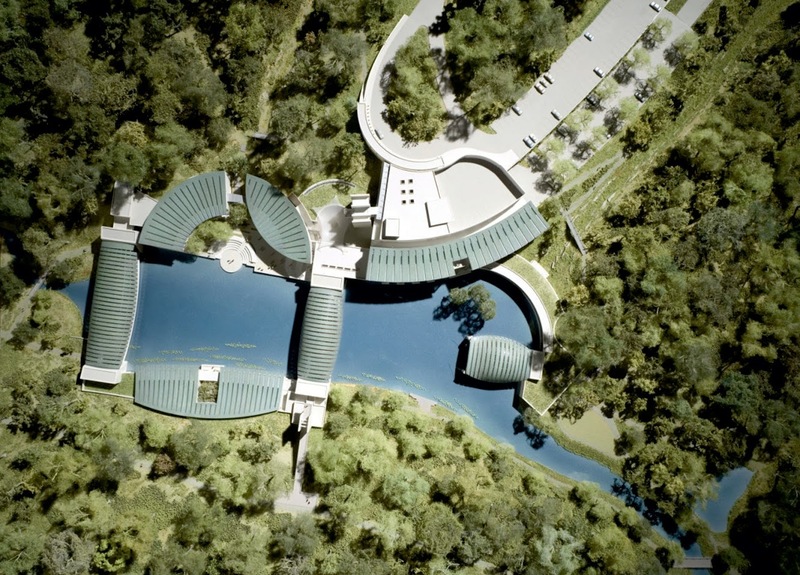 Our objective was to create a building in the spirit of the Ozarks, drawing on the traditions of the region. 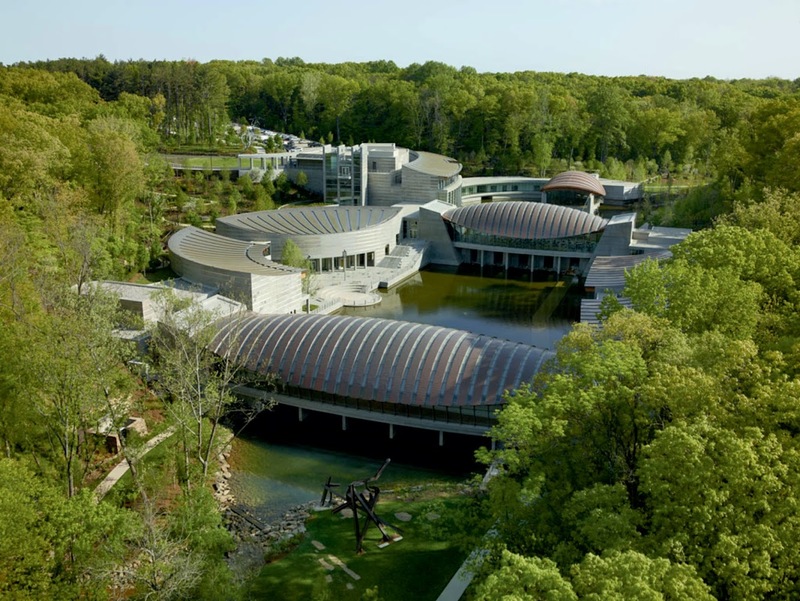 Hence, the architectural vocabulary of Crystal Bridges draws on regional materials. The structures consist of a series of concrete walls and colonnades cast in place, providing vertical enclosure and support. in turn, the roofs throughout the complex are constructed of laminated wood beams and decks made of Arkansas white pine. the concrete walls have horizontal bands of wood, placed into the recesses created by the concrete formwork. the tradition of timber construction and a generative geometry of convex-concave roof framing system, rationalize construction and create soft forms which resonate with the surrounding hillsides. 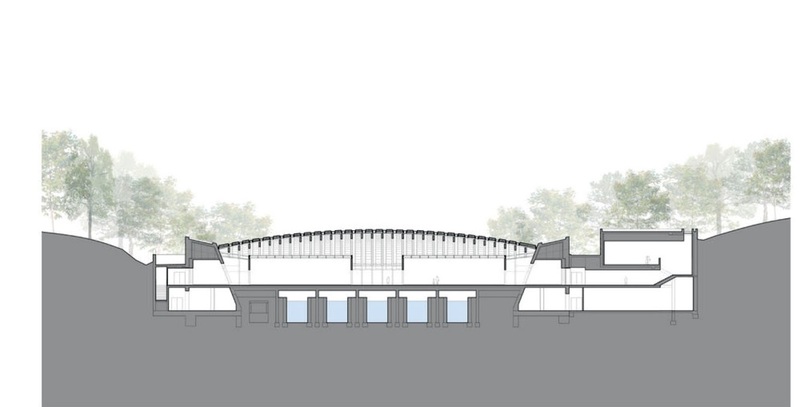 The vaulted and convex torodial roofs, clad with copper which in time will develop a rich patina, appear as an extension of the surrounding flora. the structural articulation is expressed on the exterior as the roofs form a light, lattice-like rhythm, punctuated by linear skylights. There are a variety of galleries for the collection which ranges in size and scale as well as period. There are galleries for traditional and contemporary art and changing exhibitions. Some galleries are endowed with daylight filtering through the wood structure, and then by a second layer of diffusers, providing the necessary controls for the art on display. 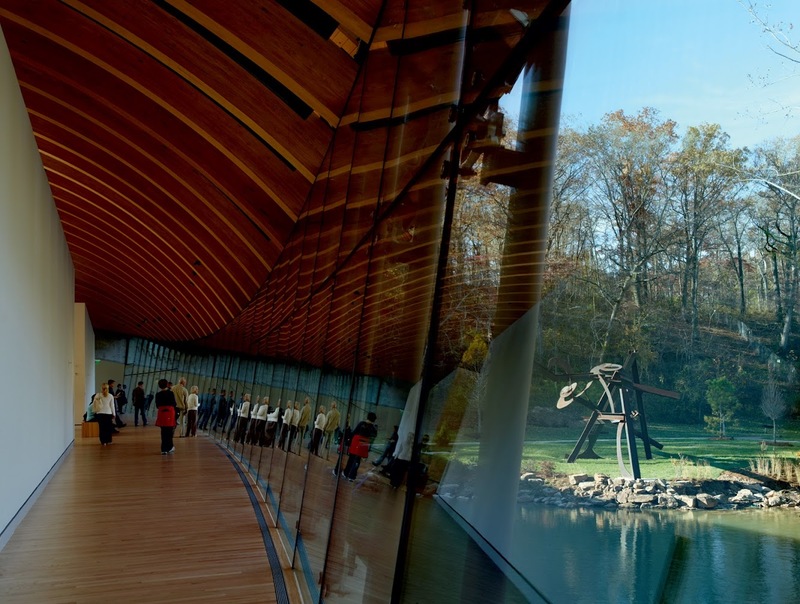 Most galleries enjoy the warmth of light reflected upon the wood ceiling structure, resulting in a warm aura highlighting the full range of the spectrum. in the two bridge buildings and the Great Hall, the floor structure is rooted in the earth which forms a dam. In contrast, the roof enclosure is literally a suspension bridge – catenary cables span from one side of the ravine to the other, with the laminated wood beams vaulting across from cable to cable, column free, from “coast to coast”. 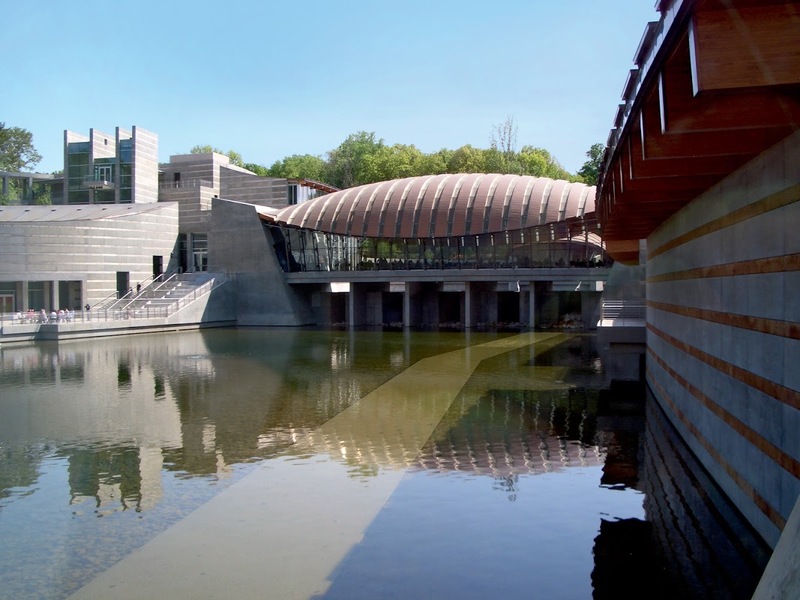 Standing on these bridges, one has an expansive view up and down the stream, into the reflective ponds and the other pavilions in the complex." Descriprion of Architects.